Born and raised in Sao Paulo, Brazil, Angel B is an icon in the dance industry in her country as a hip hop choreographer and dancer for some the top names in the business as Negra Li, Ivete Sangalo, Wanessa, Rodriguinho and many others who had contributed. Represented by Bloc Agency, her most recent credits in the USA include Snoop Dogg & Wiz Khalifa “The High Road Tour”, Cee-lo Green, Pharrell Williams -The Voice, Janell Monae “American Idol”, Ne-yo feat Kalifa, Kendrik Lamar BET Awards, Becky G Promo Tour and East Los High seasons 1-3. She has choreographed and danced for Eve in her Brazilian Tour, and Opening Beyonce`s Concert in Brazil tour as well, danced for Kanye West at SWU festival, Yandell, Chromeo, Anthony Lewis and more. 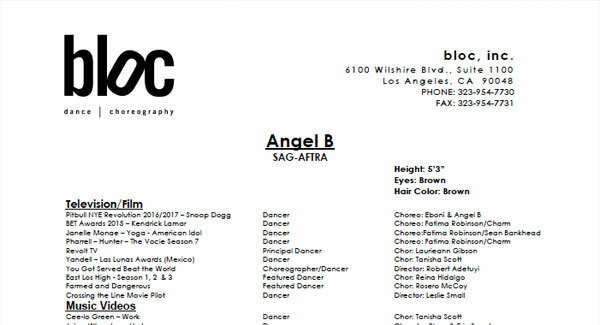 Angel B has choreographed and played MARIA in the movie YOU GOT SERVED BEAT THE WORLD, directed by the writer of the movie Stomp the Yard. Principal Dancer on McDonalds Commercial, Ubisoft “The Hip Hop Experience”, Teleton USA, HEAD Sport Wear and XL Energy Drink. Angel was a “Debbie Reynolds Studio” dance teacher for 5 years. Currently she’s working consistently with the Rapper Snoop Dogg and her music career.